Alice-Miranda at School by Jacqueline Harvey. Review: Jacqueline Harvey has done an excellent job writing Alice-Miranda at School. Alice- Miranda has some tough problems to face at Winchesterfield-Downsfordvale Academy for Proper Young Ladies. No only is she the youngest girl there, but Alethea is a huge enemy to avoid. The headmaster also personally despises Alice-Miranda, and sets up challenges to try to defeat her. How will she endure harsh treatment and challenges and still find a way to make it out on top? Alice-Miranda's family has all attended Winchester-Downsfordvale Academy. It's a family tradition. When young Alice arrives, she's determined to make friends, which isn't the easiest to do. Everybody in the school hates Alethea, and she hates Alice-Miranda. The headmaster also sets up extreme challenges for her. She doesn't like Alice-Miranda because she likes to brighten everybody's mood and she's too bold. Alice-Miranda has to pass an extremely hard test, a 5-day hike through the wilderness, and a sailboard race against the school champion, which happens to be Alethea. Alice-Miranda also discovers that most people at Winchesterfield-Downsfordvale Academy for Proper Young Ladies are unhappy. The gardener can't plant flowers, the cook can't get to go on vacation, and the students are afraid of the headmaster. They've never seen her. On the hike, somebody from the wilderness follows Alice-Miranda and makes noises at night. Who is he? Can she pass the challenges and truly earn her rightful place at Winchesterfield-Downsfordvale Academy for Proper Young Ladies? Jacqueline Harvey did an excellent job writing Alice-Miranda at School. She has done a great job portraying each of the characters' personalities. She understands the problems that most young girls face. Often, other bullies scare them, but not Alice-Miranda Highton-Smith Kennington-Jones. She defeats hate by love. All the teachers soon like her and she makes numerous friends with people all over the academy. Harvey illustrates a story in which Alice-Miranda has to overcome unfair challenges to show the headmaster, Miss Grimm, that she really does belong at the academy. Harvey writes with enthusiasm and develops each character's enthusiasm levels due to Alice-Miranda. 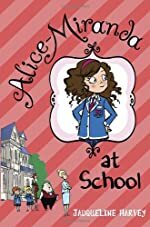 Read Alice-Miranda at School to find out how a young girl of 7, Alice-Miranda, brightens the mood and makes her stay enjoyable at Winchesterfield-Downsfordvale Academy for Proper Young Ladies. This was an excellent book and I rate it five out of five stars. We would like to thank Random House for providing a copy of Alice-Miranda at School for this review. Have you read Alice-Miranda at School? How would you rate it?